In 1998, an official board was formed to restore the building and develop the museum. The restored building was dedicated in December of 2000. Two years of restoration-conservation work went into the building before any mechanicals or finished carpentry could be accomplished. Three-and-one-half dumpsters of trash, drop ceilings, temporary walls, etc. were removed. This did not include ancient plaster laths from the second floor and buckets and buckets of old plaster, linoleum and other cover-up flooring from the first floor. All of the knob and tube wiring, the old furnace, and the minimal plumbing had to be removed. BUT, there was no kitchen to remove because the building never had a kitchen!!! Since the original building dates from 1837, it had a summer kitchen at the rear. Also, a large brick wall at the rear of the property and a couple of lean-to type walls had to be removed from the premises. Volunteers from our community accomplished all the work. People who work as accountants, business owners, plumbers, County and City employees worked here on weekends. The stabilization of the building came next. The rear brick wall had to be rebuilt. The original machine shop (now the Industrial Hall) had to be shored up through the center in order to handle the weight of the stoves. The cigar manufactory roof needed to be stabilized to handle the extra weight of the state of the art rubber roof. The staircase had to be rebuilt because half of it was removed in 1913. The original windows no longer existed so new windows had to be installed. Carpenter, Fred Engel, installed the staircase and the new windows. 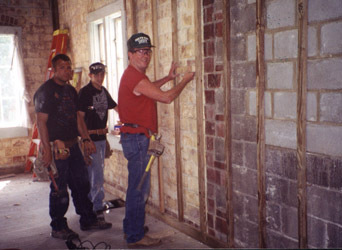 The rear brick wall was rebuilt by bricklayers Roger and Heath Wentz. The foundation parging had to be removed and secured. Brick mason, George Uhl, did that. Again, much of this work, such as the removal of the parging, was done with hours and hours of volunteer help. Volunteers installed the new floor in the Industrial Hall — the job took a complete summer! Finally, we were ready for new plaster walls, but the building needed to be insulated. That was a job no one wanted to do, but it was accomplished with the help of volunteers. All the walls needed to be "firred out". The Carpenter Apprentice Program did that. The original floors needed to be refinished. That was a volunteer job. The mechanicals were donated. Belleville Supply Company donated the fixtures for the two handicapped bathrooms, and the Plumbers Apprentice Program handled the installation. Belleville Mechanical donated the heating and cooling system with the installation included. IBEW Local 309 donated all the wiring and electrical work. Painters Local 58 and 85 did all the painting that required professional help. All the inside and outside doors are original but they needed to be rehung. The bathrooms and office floors have new coverings. 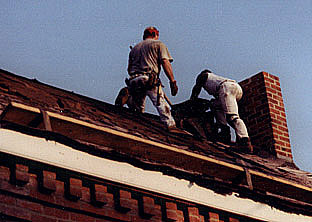 Carpenter Fred Engel accomplished these tasks and many more. Read about the building history.